Concert is applying its industry-leading expertise in deuterium chemistry to discover and develop innovative drug products. 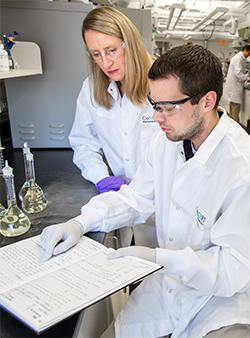 We use our DCE Platform® to create novel drugs designed to have superior properties—including enhanced clinical safety, tolerability or efficacy—based on compounds that have established pharmacological activity. The average adult human body contains approximately two grams of deuterium. While essentially identical to hydrogen in size and shape, deuterium differs from hydrogen in that it contains an additional neutron. As a result, deuterium forms a more stable chemical bond with carbon than does hydrogen. 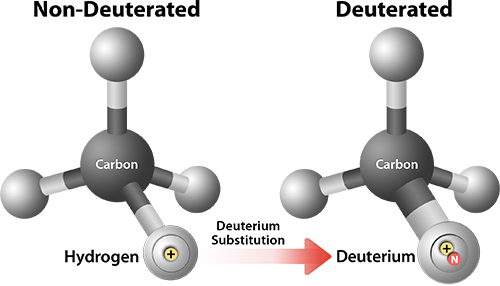 The deuterium-carbon bond is typically six to nine times more stable than the hydrogen-carbon bond. This has important implications for drug development because drug metabolism often involves the breaking of hydrogen-carbon bonds. Because deuterium forms more stable bonds with carbon, deuterium substitution can in some cases alter drug metabolism including, through improved metabolic stability, reducing the formation of toxic metabolites, increasing the formation of desired active metabolites, or a combination of these effects. Deuterated compounds can have an increased half-life in the body and increased systemic exposure as compared to their corresponding non-deuterated analogs, and these properties can lead to therapeutic benefits such as improved safety, efficacy, tolerability and convenience. Deuterated compounds can generally be expected to retain biochemical potency and selectivity similar to their hydrogen analogs. The effects, if any, of deuterium substitution on metabolic properties are highly dependent on the specific molecular positions at which deuterium is substituted for hydrogen. In addition, the metabolic effects of deuterium substitution, if any, are unpredictable, even in compounds that have similar chemical structures.